Home / Posts Tagged "email control"
Email monitoring can reveal a treasure-trove of information about how your email system is actually being used. Not how much RAM or storage space is being used, or how many spam messages are blocked each day, but how your employees are actually using email to perform their jobs. With email monitoring, the amount of intelligence that is available to you in aggregate is overwhelming, and can help you to learn more about your company, identify waste, improve efficiencies, and get a better handle on both compliance and customer service. Email monitoring enables you to mine your email for patterns that will reveal very useful information about just how communications flow within your company and amongst partners, vendors, and customers. Seeing who is mailing who can show you who the strong communicators are, as well as who spends too much time emailing instead of “doing”. It can identify the needy folks who require a little more attention than others, and in the event of an unplanned turnover, can help to quickly identify who the key contacts were for a user who is no longer there. Email is becoming the most important tool most users have for communications, and it’s very common to hear a voicemail greeting state that the fastest way to get a response is to hang up and email the person instead of leaving a voicemail. Email monitoring can let you see response times between receiving and responding to emails, and is a great way to determine whether or not SLAs are being met, and if customers are getting answers or being ignored. And when it comes to customers, nothing is worse than an unanswered email. Remember that sales rep who worked for you six months ago, or the territory manager on vacation? What happens when a customer finally decides they are interested in making a purchase? Emails that go to inactive accounts lead to lost sales. Email monitoring can show you which old accounts are still getting email messages so you can set up forwarders and never lose another deal because no one responded to the customer’s email. One thing most email systems will never have enough of is storage. Email monitoring helps you check for the hoarders, the ones who email non-business related files back and forth, and the people who use email like FTP. This will enable you to get a handle on your storage before you have to send out that urgent request asking everyone to purge their deleted items to free up space. Compliance is another critical issue for many companies today, and email monitoring is a great tool to assist with this. Whether that is compliance with internal policies, proper business communications, or regulatory needs, being able to identify emails with inappropriate language, messages that are being forwarded or BCC-d to personal accounts, or communications with potential competitors is vital to protect the company’s interests and ensure that no customer is offended by unprofessional language, and no proprietary information is being emailed offsite. Administrators spend significant time looking at their servers’ performance, their log files, and their resources, while ignoring the way users are actually using the systems. Email monitoring is a great way to get a handle on what is happening from a usage perspective which can help you identify trends, patterns, and problems, and get a better understanding of the whole system, from the server to the client. So dust off that horde of useful data and see what’s going on inside with email monitoring. Do you want to regulate the use of email to send commercial messages in your corporation? Do you have a desire to restrict sender by only allowing employees to use specific mailbox to send emails and prohibiting using other mailbox? As the importance of electronic mail has grown both for internal communications with co-workers and for external communications with customers, suppliers and business partners, so has the need to ensure that your email servers are working properly. Monitoring and maintaining the health of your email servers has become vital in your business’ communication and even in its very existence. 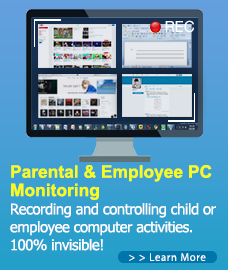 SurveilStar Email Monitoring is the all-in-one network monitoring solution, which covers the complete range of monitoring needs from availability monitoring to bandwidth and usage monitoring, as well as application, instant message and email monitoring. Record email subjects, senders, recipients, time, size, etc. If you need to prevent one or multiple spammers, block some emails addresses, restrict the employees to send emails only to permitted email addresses, prohibit sending attachments or limit email size, you can set an Email policy to achieve the goals easily. Setting up a proper email policy for your business situation is just a breeze. 2. 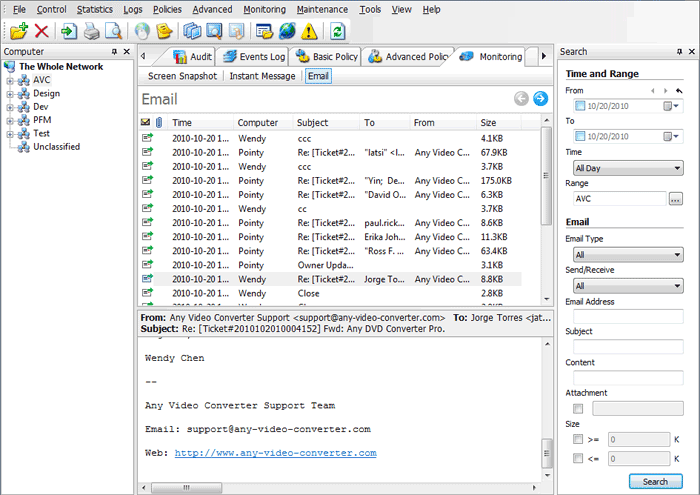 Login SurveilStar Console, select the target computer (group) that you want to monitor email activity. Navigate to Monitoring >Email.